It's a market the Mad Hatter would love. Momentum stocks Apple and Facebook rally. But so are stodgy J&J and Hershey. And why not? 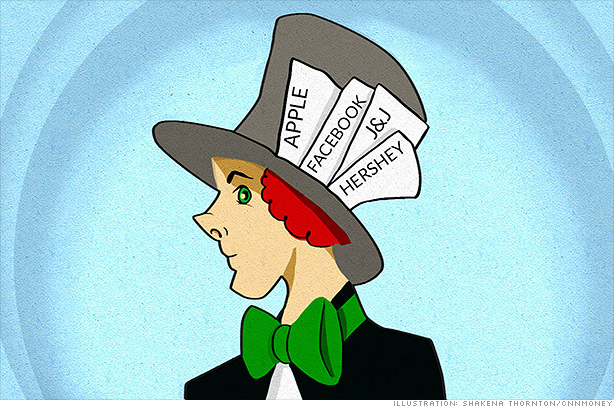 It seems like many days on Wall Street are about as absurd as the Mad Hatter's tea party. Second-quarter earnings have been decent. But not spectacular. According to FactSet Research, profits for the companies in the S&P 500 that have reported results so far are up just 1.9% from a year ago. That's not exactly the kind of growth you'd associate with a roaring (or is it raging?) bull market. And with the economy continuing to hum along at an okay pace, there are still legitimate concerns that the Federal Reserve will taper (a word I hoped would die while I was down the rabbit hole of parental leave for a month, but has stubbornly stuck around) its bond buying program as soon as September. Yet, the Dow and S&P 500 are back near all-time highs after a dismal June. The CNNMoney Fear & Greed Index is once again flashing Gordon Gekko-ish signals. The market's summer slump sure didn't last long. Even left-for-dead tech stocks Apple (AAPL) and Facebook (FB) have suddenly shot back to life thanks to solid earnings and a sudden change in sentiment. But here's where things get really bizarre. Based on all I just said (or wrote ... although for a nominal fee, I'd be happy to sell you an audio version of this column ... maybe with Samuel L. Jackson reading to make it more dramatic?) you would think that boring, dividend-paying stocks would be taking it on the chin lately. After all, it sounds like investors have an appetite for (destruction?) risk again. Check this out. The following stocks have all hit all-time highs in the past few days. Not mere 52-week highs, mind you. All-time. Never ever been higher than right now. A health care products giant, medical insurer, three food companies, a supermarket chain and an underwear maker? Really? That doesn't sound inherently exciting. It sounds like a portfolio that Warren Buffett could love. In fact, Buffett's Berkshire Hathaway (BRKA) (BRKB) owns a big stake in JNJ, food kingpins Kraft (KRFT) and Mondelez (MDLZ), as well as shares of British grocer Tesco. What's more, Berkshire is the parent company of Hanes competitor Fruit of the Loom and Hershey rival See's Candies. John Norris, managing director with Oakworth Capital Bank in Birmingham, Ala., said it makes sense that stodgier stocks are trading at their peaks. He thinks a lot of investors, especially retirees, want to own something that will earn more than a bond or savings account ... but that's not as volatile as a tech stock. All seven of the companies I just listed pay healthy, steady dividends. They should provide dependable sales and earnings growth if the economy takes a turn for the worse. "A lot of older investors are more comfortable taking a little more risk but they are not going to take crazy risk. They understand what these household name companies do," Norris said. Sure, some things haven't changed much in the past month. Tesla (TSLA) is still Tesla. Amazon (AMZN) is not far from its all-time high. But this still looks like one of the most tepid market rallies in recent memory. Investors seem too scared to dump "safe" consumer and health care stocks because they don't want to abandon the yield they can get from those quarterly payouts. Many experienced investors remember what happened in 2000 and 2007 when stocks were at all-time highs. They've been through that particular looking glass before. And they don't want to be Tweedledum and Tweedledee. Anyway, it's good to be back after a month off. I figured I'd celebrate with a goofy pop culture Twitter challenge! I asked my followers to identify a line from a film. My inspiration was the strong performance of IHOP owner DineEquity (DIN) after the company reported some Rooty Tooty Fresh 'N Fruity earnings. "RT @LaMonicaBuzz: We stop at pancakes house. Name that movie for Buzz shout-out!" Fargo. Done with Twitter today. Well-played. Good luck staying off of Twitter for the rest of the day. And a word of advice. Don't go near the wood chipper.